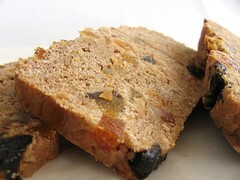 Fruit and Spice Loaf Cake - Do You Know The Muffin Man? Recipe from Desserts by Pierre Hermé by Dorie Greenspan. Notes: According to the notes, this cake is in the style of the classic French pain d'epices. The blend of spices for this cake is dazzling: star anise, cinnamon, ginger, black pepper, coriander, cardamom and nutmeg. However, the cake turned out to be a letdown. It was quite dense, almost like a dry pudding. There wasn't enough honey to balance out the tartness from the apricots and prunes, so it's a little bland. On a positive note, the blend of spices is complex enough to make you try to identify the various components. I'd make it again, but with a different choice for the fruit and nuts, even omitting them altogether.